It’s the beginning of a short soliloquy from Walton Jones’ play The 1940’s Radio Hour, and as she continues with the monologue it’s easy to see that the young woman knows what she’s doing. Her smile grows while she goes on to recount the doorman’s change of tune—like she’s letting you in on the joke. Her lips curl as she seizes on just the right words, playing with their cadence. Her expressions are so finely calibrated, her reading so assured, that with the dark background behind her, you’d think you were watching a black-box revival of the late-’70s Broadway play. There’s only one problem: Her body disappears below the neck. Yaser Sheikh reaches out and stops the video. 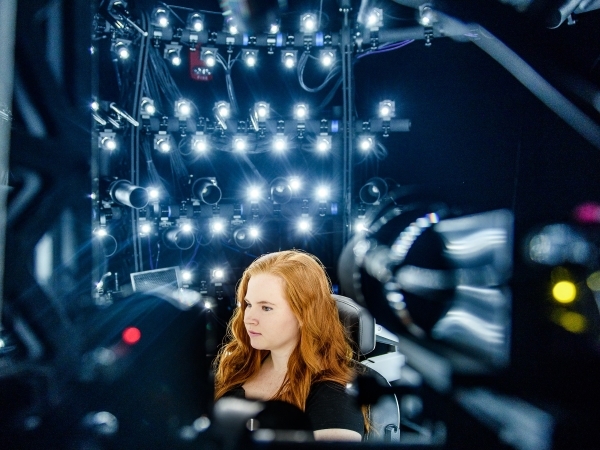 The woman is a stunningly lifelike virtual-reality avatar, her performance generated by data gathered beforehand. But Sheikh, who heads up Facebook Reality Labs’ Pittsburgh location, has another video he considers more impressive. In it, the same woman appears wearing a VR headset, as does a young man. Their headsetted real-life selves chat on the left side of the screen; on the right side, simultaneously, their avatars carry on in perfect concert. As mundane as the conversation is—they talk about hot yoga—it’s also an unprecedented glimpse at the future. In the 1927 essay “The Unconscious Patterning of Behavior in Society,” anthropologist Edward Sapir wrote that humans respond to gestures “in accordance with an elaborate and secret code that is written nowhere, known by none, and understood by all.” Nintey-two years later, replicating that elaborate code has become Sheik’s abiding mission. The theory underlying Codec Avatars is simple and twofold, what Sheikh calls the “ego test” and the “mom test”: You should love your avatar, and your loved ones should as well. The process enabling the avatars is something far more complicated—as I discovered for myself during two different capture procedures. The first takes place in a domelike enclosure called Mugsy, the walls and ceiling of which are studded with 132 off-the-shelf Canon lenses and 350 lights focused toward a chair. Sitting at the center feels like being in a black hole made of paparazzi. “I had awkwardly named it Mugshooter,” Sheikh admits. “Then we realized it’s a horrible, unfriendly name.” That was a couple of versions ago; Mugsy has increased steadily in both cameras and capability, sending early kludges (like using a ping-pong ball on a string to help participants hold their face in the right place, car-in-the-garage-style) to deserved obsolescence. If the word panopticon comes to mind, it should—though it would be better applied to the second capture area, a larger dome known internally as the Sociopticon. (Before joining Oculus/Facebook, Sheikh established its predecessor, Panoptic Studio, at Carnegie Mellon.) The Sociopticon looks a lot like Microsoft’s Mixed Reality Capture Studio, albeit with more cameras (180 to 106) that are also higher-resolution (2.5K by 4K versus 2K by 2K) and capture a higher frame rate (90Hz versus 30 or 60). Where Mugsy concentrated on your face, the Sociopticon helps the Codec Avatar system learn how our bodies move—and our clothes. So my time in there is less about facial expression and more about what I’d describe as Lazy Calisthenics: shaking out limbs, jumping around, playing charades with Belko via webcam. The point is to capture as much information as possible (Mugsy and the Sociopticon gather 180 gigabytes every second) so that a neural network can learn to map expressions and movements to sounds and muscle deformations, from every possible angle. The more information it captures, the stronger its “deep appearance model” becomes and the better it can be trained to encode that information as data—and then decode it on the other end, in another person’s headset, as an avatar. As anyone who struggled through video compression woes in the early days of the internet knows, that’s where the “codec” in Codec Avatars comes from: coder/decoder. Someday soon, Sheikh and his team want to be able to extend that face scan to the whole body, so the software will need to be able to work around what Saragih calls “extrinsics”—the weirdnesses that would otherwise make a virtual interaction less lifelike. If it’s dark where you are, for example, the system needs to be able to compensate. If you move your hand behind your back, the system needs to be able to account for that so that if your friend walks behind you (in VR), they can see what your hand is doing. There are others, like being able to predict how you move in order to keep your avatar’s movement as smooth as possible, but they’re all aimed at removing the variables and letting your avatar be an unfettered, undiluted representation of you. Animating people is hard. That’s just the truth. Even mega-blockbuster videogames struggle with things like hair, eyes, and the inside of the mouth—and errant paths lead straight into the uncanny valley, that visceral discomfort brought on by seeing something that looks almost but not quite human. After my experience with the capture process, when I put a headset on to chat live with Sheikh and researcher Steve Lombardi, I’m fully expecting the reality of the virtuality to fall into that same trap. Nope. Sheikh’s avatar doesn’t have the beard or owlishly round glasses he wears in real life (ostensibly they’re harder to get right, so he did the capture without them), but it’s him. It’s him so much that when he invites me to lean in and take a closer look at the stubble on his face, it feels incredibly invasive to do so. It’s so much Steve Lombardi that, when he later walks into the room for real, I feel like I already know him—despite never having met him in the flesh. The results aren’t perfect. When people are speaking excitedly, their avatars’ mouths don’t move quite as much as their tone would suggest; hair is visible to the individual strand but has a hazy aura around it; tongues look a bit fuzzy. But the aggregate effect is overwhelmingly something along the lines of this shouldn’t be possible. That’s a marvelous thing to experience. Troubling, too. While Codec Avatars are still little more than a research project, we’re learning about them at an uncertain time. Deepfakes, AI so powerful it can create faces from nothing, data privacy, misinformation campaigns, and toxic behavior have all become very real issues on a very real internet—and as VR and AR begin to make inroads toward becoming humanity’s dominant communications platforms, funded by a social media company that’s been at the epicenter of some of those issues, they’ll become even more pressing. You thought harassment was bad online? You thought VR, which adds embodiment and personal space to the mix, made it even more viscerally disturbing? You ain’t seen nothing yet. Sheikh understands the concern. “Authenticity isn’t just crucial to the success of this, it’s crucial to protecting users as well,” he says. “If you get a call from your mother and you hear her voice, there isn’t an iota of doubt in your mind that what she says is what you hear, right? We have to build that trust and maintain it from the start.” He cites the sensors on the HMCs as a crucial means of authentication—our eyes, voices, even mannerisms are all biometrics of a sort. (Which, yes, allays one concern but also intensifies another.) Conversations around data privacy and VR have been growing louder over the past few years, but a breakthrough like this may well turn them up to 11. Sitting with Yaser Sheikh now, I ask him how he’d felt about Abrash’s proclamation at the time. “He’s right,” he says, smiling and sipping his coffee.